Beginning to recognize more of the minor details. A small portion of the eye was protruding from the surface a fresh split. A bit of scratching under the microscope revealed my favorite so far. I call it #7. OK, ...... I'm hooked ! That one came out very nice!! I thought I might have found #8. I first saw what looked like a brachiopod with a crinoid stem perfectly centered. I was contemplating a caption ... Dude, I was here first. Then I saw what looked like the the surface of another cephalon. I started scratching it out and now do not understand what it is, or where its going. 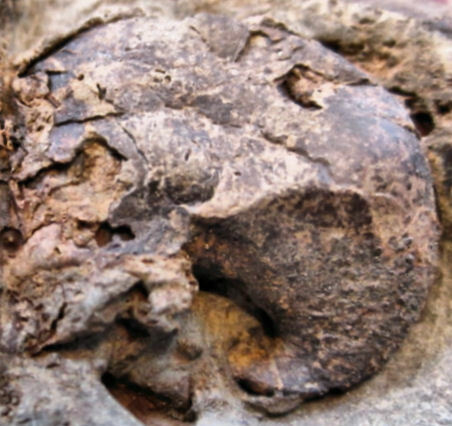 It almost looks like a gastropod, but also looks like it may be a severely damaged trilobite. Can you recognize it and give me an idea as to where I should continue scratching ? or not? That looks like a cephalon next to a brach with a crinoid imprinted on it. The first cephalon a real Beauty, amazing find! This one is a gastropod: Platyceras sp. A new label for my collection ! Found another one, this one with the other end up.